The Isles of Capri are really peninsulas, but they look and feel like islands. The Isles are slightly more than a mile’s drive from Collier Boulevard through dense preserve via Capri Boulevard. Once in the Isles, Capri Boulevard continues all the way to Pelican Street at land’s end on the south of the community. Although most homes in the Isles of Capri have private docks, slips, or boat lifts, the Isle of Capri Marina is also available for this community where every waterfront property have direct, unhindered, and almost immediate access to the Gulf of Mexico and the pristine inland waterways. La Peninsula is a gated, luxury condo resort neighborhood situated at the most seaward end of the Isles. The condos of La Peninsula are ideal for both resident and non-resident owners. Condos range in size from 1,435 square feet to 2,200 square feet housed in six mid-rise, waterfront buildings. The neighborhood surrounds lushly landscaped gardens, at the center of which is a private clubhouse with pool with lap lanes and shallow area, a Jacuzzi-type spa and an expansive deck. Four Har-Tru tennis courts are just to the north of the clubhouse. Owners in La Peninsula may lease their units up to four times in and calendar year or rolling 12-month period. Leases must be no less than 30 days and no longer than one year. Annual leases may be renewed at the board’s discretion. Twin Dolphins is a seven-story building housing 37 condominiums. These upscale condos range in size from just under 3,000 square feet to over 4,700 square feet. In addition to the sheltered pool, the complex offers tennis courts and exercise facilities for those with an active lifestyle. There is also a relaxing spa, hot tub, and sauna as well as quieter activities like billiards. Guest suites are available so that your visitors can stay on site. Facilities include a private, free-form pool, the type of which is rarely seen outside of luxury resorts tennis courts and exercise facilities for those with an active lifestyle. There is also a relaxing spa, hot tub, and sauna as well as quieter activities like billiards. Guest suites are available so that your visitors can stay on site. Owners in Twin Dolphins may lease their units up to three times in and calendar year or rolling 12-month period. Leases must be no less than 30 days and no longer than one year. Annual leases may be renewed at the board’s discretion. The 58 one and two-bedroom condos Marco Towers are between 941 and 1,112 square feet. Owner share a common dock and fishing pier, swimming pool, and Jacuzzi. The units have a southern exposure, allowing residents a view of the northern beaches of Marco Island and the Rookery Bay National Estuarine Reserve just across the bay. The Marco Tower neighborhood has been described as “a quiet life sanctuary.” Owners may lease their units for a minimum of 30 days, and all leases must be approved in advance by the HOA’s board of directors. 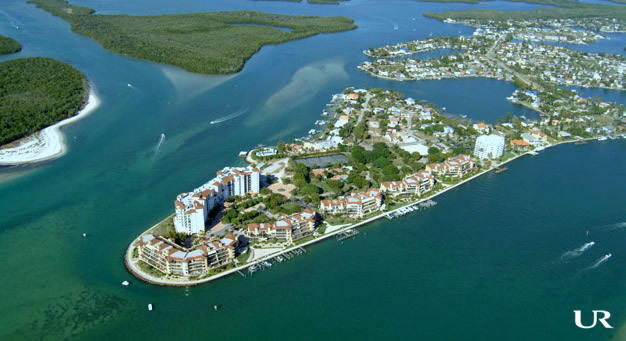 The Isles of Capri community offers easy access to Marco Island, the Ten Thousand Islands, and Naples. Interstate 75 makes it convenient for residents to visit Ft. Myers, Port Charlotte, Sarasota, Tampa, Orlando, or Florida’s east coast cities as well. Convenient. Quite. Tranquil. The Isles of Capri.